Internships have become essential to the university experience. Internships help develop critical professional skills that students can apply in their first jobs after graduation. ​Completing an internship abroad shows future employers that you are flexible and have a willingness to learn. Thanks to its numerous partnerships with reputable American companies, Seagull Institute offers you the opportunity to immerse yourself in an competitive internship while also receiving everyday assistance from Seagull staff. Beyond professional learning, you will have the opportunity to improve your language skills and discover the cultural subtleties of the new environment. Our assistance and support in all your efforts including obtaining a Visa, resume and cover letter review, etc. Free access to numerous extracurricular activities like sports, volunteering, workshops, etc. 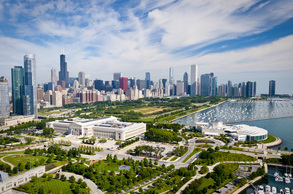 ﻿Chicago is the third largest city in the United States also known as the Silicon Valley of the Midwest. Traveling to the United States seems like a time-consuming process? Relax and let us guide you through the process. ﻿Our prices include many services before, during, and after your internship. In addition, it includes various cultural and sports activtities during your stay.